Green Oak Morris Men are a side who perform the traditional men's dances of England, both Morris and Sword. 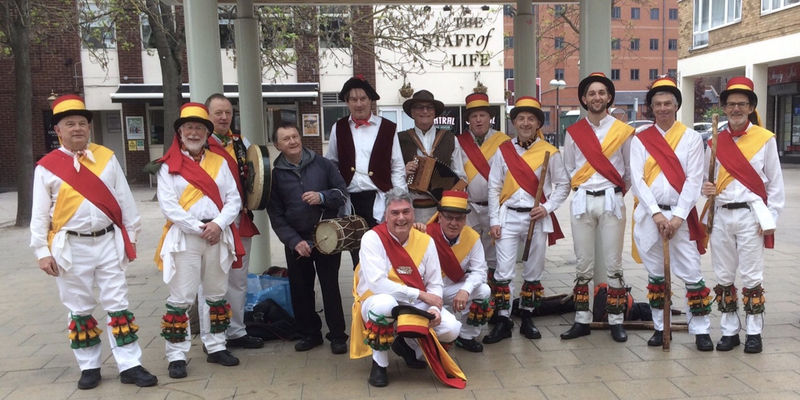 We practice during winter months at Doncaster Brewery Tap in Young Street and in summer we dance out in and around Doncaster. Our style is based on traditional dances from Cotswold villages (and further afield) including Adderbury, Bampton, Bledington, Bucknell, Fieldtown and Headington. We always dance to live music, the instruments used may include accordion, melodeon, pipe & tabor, recorder, drum. Our group is a member of “The Morris Ring”. At Christmas, we often perform a Mummer's Play. New members are welcome, and no experience is needed to join. Beginners, you are welcome! We continue to get frequent requests to dance out at summer garden parties, events, fairs, winter festivals etc. We would dearly love to accept all of these requests. However, we prefer to present a full side of six men and at least one musician. It is not very often that we can accept firm bookings due to these considerations. In other words, we need more men to join us! Experienced or beginners are welcome. All you need is enthusiasm!